January 30 was Senior Recognition Day, and the nine seniors in Whitman’s lineup did not disappoint, going a collective 9-0. Senior Ezra Alexander kicked off the match with a 20 second pin of his 182 pound opponent, and sophomore John-Luke Iglesias at 195 pounds followed that with a 41 second pin. Senior Tony Rangel received a forfeit at the 220 pound level, and then senior Jacob Winch achieved a pin in the second period of his 285 pound match. Whitman led 24-0. At the 106 pound level, senior Chris Habibian pinned his man in the first period, and sophomore Clark Boinis decisioned a tough 113 pound adversary, 7-2. The only freshman in the lineup, Colby Fong, wrestling in the 120 pound category, fought his way into the second period where he was pinned by a Wheaton junior. 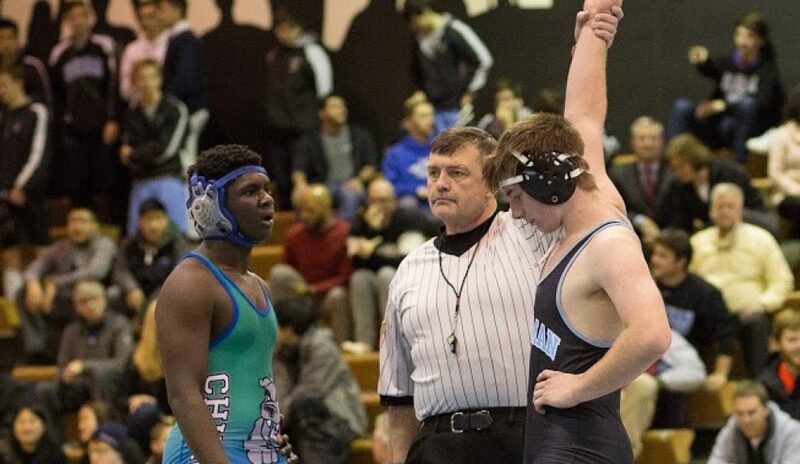 Whitman’s 126 pound wrestler, sophomore James Mackall, pinned his opponent in the second round, and senior James Bamberger decisioned his 132 pound Wheaton adversary, 10-3. Whitman then elected to forfeit at the 138 pound level to Wheaton’s Xavier Howard, ranked 16th in the State at that weight. The score was 42-12, and Whitman went on from there to take the final four matches. Senior Hamoon Shokoohinia gained a pin in the second round of his 145 pound match. Wheaton forfeited to 152 pound senior Mitch Fenton and 160 pound senior Braedan McKee, and senior Marcos Solloso concluded the wrestling with a second period pin of his 170 pound Wheaton counterpart. Final score, Whitman 66, Wheaton 12. -Tuesday, February 2, 6:15 pm, at Gaithersburg High School. -Wednesday, February 3, 4:30 pm, a tri-meet against Damascus and Wootton at Wootton High School. -Thursday, February 4, 6:15 pm, at Clarksburg High School. -Saturday, February 6, 2:30 pm, a tri-meet at home against Bethesda-Chevy Chase and Walter Johnson.